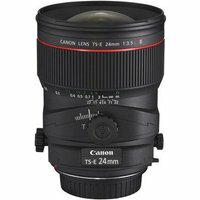 The revised Canon TS-E 24mm f/3.5L II tilt and shift lens is specifically designed for architectural photography. With a wide-angle 24mm focal length and ±8.5° of tilt available, plus ±12mm shift and ±90° of rotation on both the tilt and shift mechanisms, the TS-E 24 mm f/3.5L II offers exceptional flexibility. It also feature locks on the tilt and shift mechanisms to avoid unwanted movements.